If you've been following this blog for a while, you know that I am no stranger to weird and funky mix up manicures. Today's is another one of those crazy ones! But this one actually has a purpose, more than just making a statement (which it does, too). Nail wraps are pretty big right now. They are everywhere, and in every style. I've seen wraps made out of real polish, wraps that are essentially nail stickers, and more... The wraps I am wearing in this manicure are actually vinyl, and they are by Jamberry Nail Shields. The usual problem with wraps is the cost. But, never fear! I've come up with a solution to extend the life of your set of wraps: the mix up manicure! For my design, I chose the Peacock nail shield. You can see it in action on my fourth finger and on my thumb. The only thing I would do differently is to add a bit of nail glue along the free edge of the shield. Jamberry includes this as an optional step, so I skipped it. Admittedly, I was pretty hard on my nails while I had these on, but the edges had a bit of wear to them after about four days. The nail glue would have helped this, I'm sure. Let's talk about the rest of this manicure. For my pointer finger, I did a marbled design using OPI My Boyfriend Scales Walls, Sally Hansen Going Green, China Glaze Sky High Top, and China Glaze Happy Go Lucky. 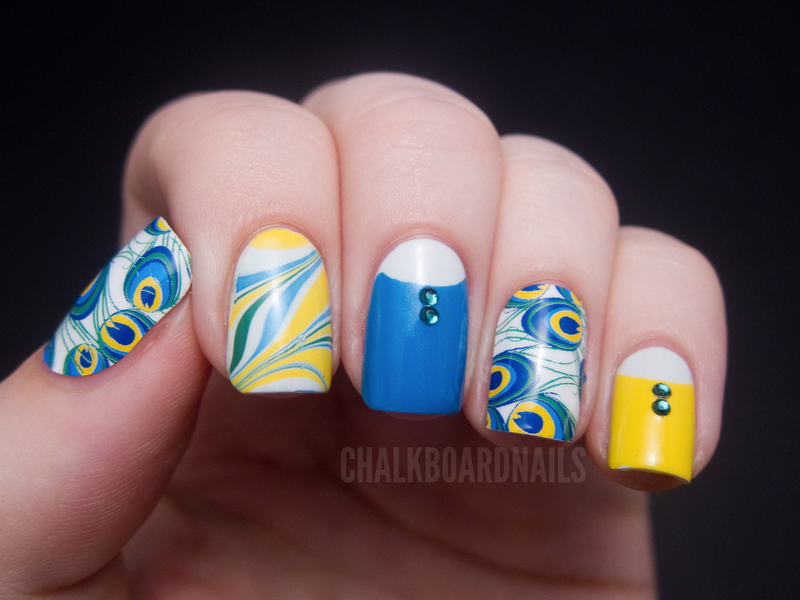 I chose those colors to mimic the colors that can be found in the peacock nail wrap. On the middle and pinky fingers, I did a half moon design using China Glaze Sky High Top and China Glaze Happy Go Lucky. I then added on a small bit of bling by attaching some green rhinestones. Seeing a pattern here? 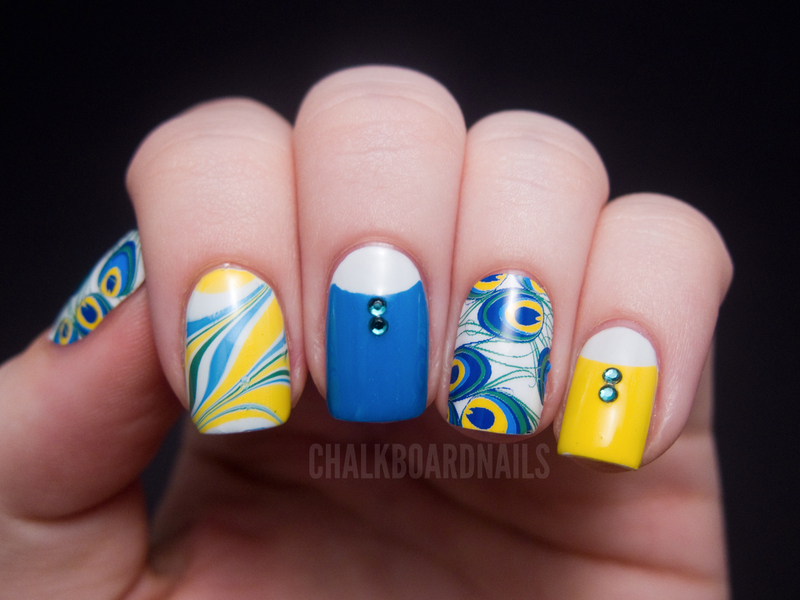 I tried to incorporate the blue, yellow, green, and white of the shields throughout this whole manicure. So as you can see, by simply applying the shields to only a few nails every time you use them, you can really get a lot of mileage out of a single sheet of wraps! Jamberry Nail Shields are available for $15.00 per sheet on their website. Jamberry says that each sheet will do 2-3 full sets of fingers and toes, so if you are doing a mix up manicure, who knows how long you can make it last! You can also check out Jamberry Nails on Facebook. The Jamberry Nail Shields in this post were provided to me by the manufacturer or their PR for review. 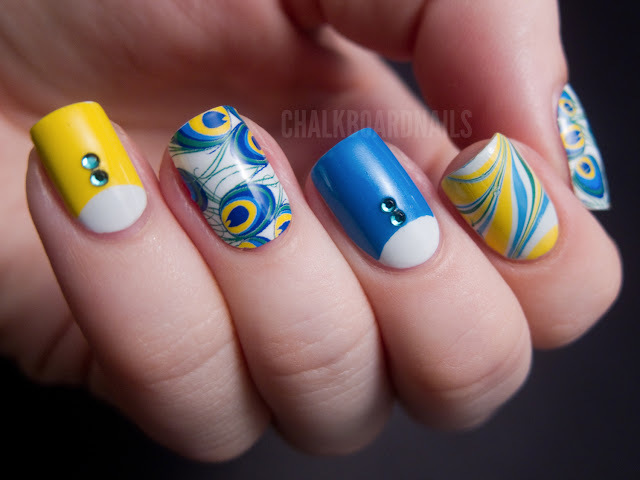 this is a beautiful mani! i love how all the colors match and the mix up look! you are soooo creative! the problem with the nail polish ones is that once you open the package you have to used them or else they dry up and wont stick. since they come in 2 packs, one for each nail, i only use one, and cut each strip in half, that way i get 2 manis out of 1 box. the sticker ones are good because they last forever, so i plan on using every single one of those stickers eventually, even the weird sized ones! i'm not letting them go to waste! these seem like a nice mix of each. last long in the package but are easy to work with, and they look beautiful! This is unbelievable!! Looks Ah-Mazing!!! this is amazing I love it! This is really beautiful! Love how different your nail designs always are..
really really gorgeous, i love these colors together!! just leaving my website for anyone that is interested.... You did an amazing job with yours.. may i share your picture? www.wildaboutnails.net I am in the process of making a better site and would love to link up with you! Hi Melissa. 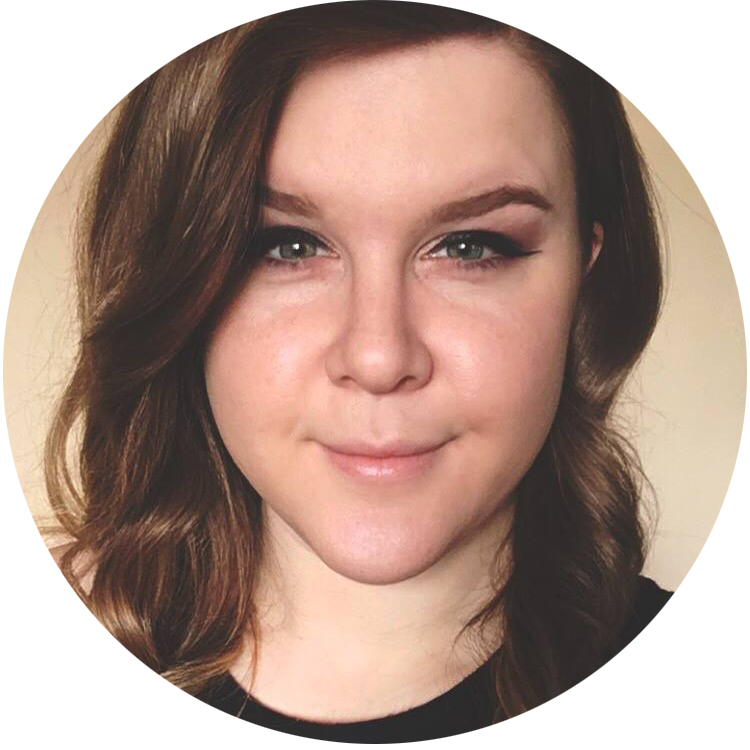 I have been working with Sarah on this site and didn't know if you knew that. Thanks for understanding and good luck with your business! Wow, these look amazing! I love the beautiful design on the shields combined with your water marbling. I've never tried shields, but this makes me want to. I am sorry about that!!! still love the post!! Gorgeous manicure, really feels in balance even though all the designs are different. Actually thought these were all wraps and you'd just give tips on how to extend the wear time! Love it! Looks very great! Jamberry's are so awesome because they don't dry out when they are opened...and so many different choices. Thanks for doing this blog for one of our incredible consultants! Wow this is simply gorgeous. the design is incredibly eye catching! This mani looks amazing! Love the colors! Very pretty. I love how you've matched all the colours together and made the design work, very creative! I was able to try out Jamberry as well, but when I went to take them off they peeled off some of my nail with them. Did you experience anything similar? Jamberry Nails will not damage your nails if you heat them up and peel slowly from the cuticle edge. I did peel my first set off and had that happen. Now that I know how to properly remove them, I have had no problem at all! What a brilliant idea! The peacock feathers are so pretty and eye-caching, but all 10 digits of them might be a little much. As you've done them, they're a great accent, and the colours totally pop! Very cool! I have used Sally Hansen;s nail wraps quite a few times and they aren't too hard once you get the hang of it. I have never tried Jamberry's though so will have to check them out. OOoooo amaaazing!!! They all look so uniform and the colours are just perfecto! Is there a way to make nail wraps last longer i.e. by putting a top coat on them? Or does that generally make them a bit floppier and ruin it? Love your blog and the always perfect nails and cuticles!! Looks great...good answer to the cost of nail wraps or whatever ya want to call them. I personally don't like the cost AND the cookie cutter look of each nail looking like a carbon copy of the others...so your mixed up nails here solve that issue. But gads...I would never spend as long as this takes to do a mani! I don't have it in me. Kudos to you! So pretty! 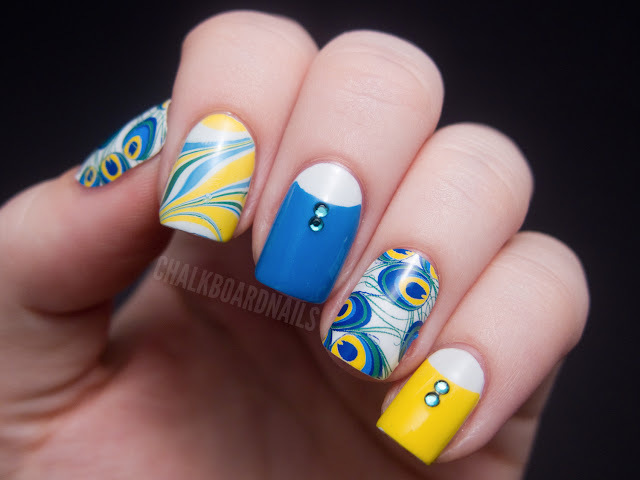 I love the peacock design, but I love the nail art you did more! I am a Jamberry nails consultant also. I love the nail shields but your idea make it looks so much better. I am glad that I found your blog. good morning, Love my nail wraps, love your posts... wondering how you store your wraps?? Some wraps don't save, like the ones that are made of real nail polish. Sticker wraps save and you can just put them in a plastic baggie. Ohh, hmm. I don't use wraps often so I don't have that many. Maybe just a plastic bin with a lid? A consultant friend stores her Jams in a photo album: perfectly-sized clear pockets, and all she has to do is flip through the pages to see what she has! OH!! Can you send a pic or give me a link so I canget the same thing! I sell jamberry and love everything about them I will never use cheap nail polish again!! Have any questions contact me I will fill u in on all the secrets! !